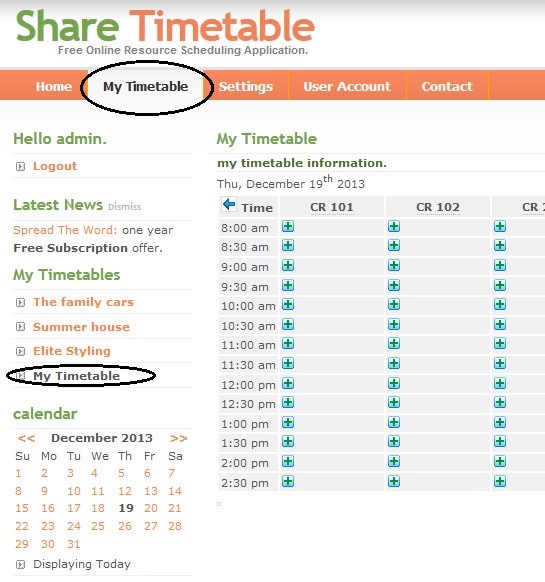 This page will detail the steps to create new timetable at Share Timetable. 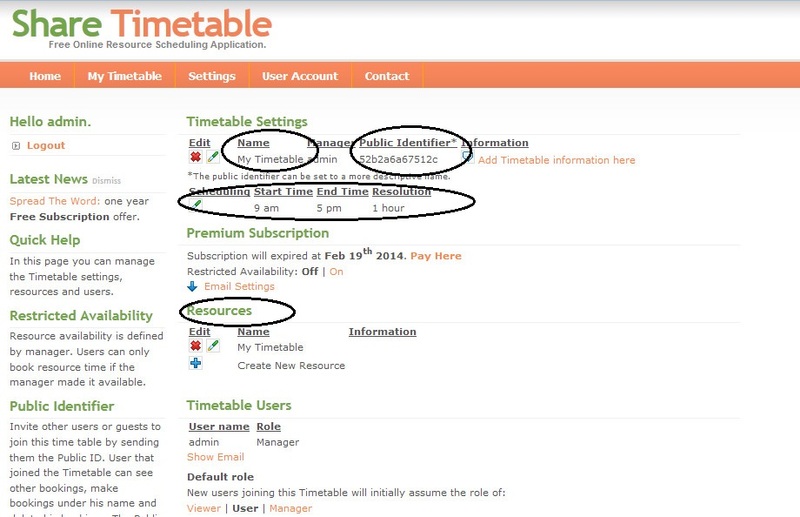 In the Setting page go the the “Create New Timetable” Section. ‘Hours’ for time-slots with in the day, example: conference rooms with 30 minutes time-slots. ‘Days’ for a Day time-slots, example: Hotel rooms. The Timetable name is the selected one. 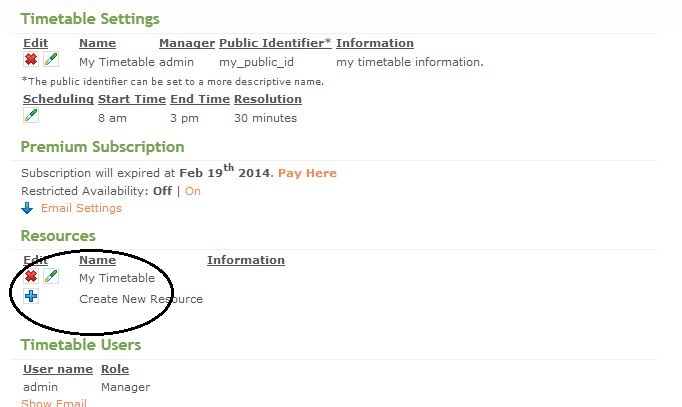 It have a default unique Public Id, the time-slots are 1 hour long, 9am to 5pm. 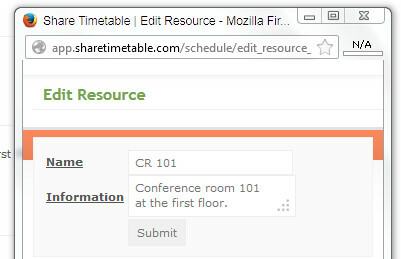 One resource is automatically added with the timetable name. Click on the pencil icon to edit the timetable attributes. The following window will pop-up. It optional to change the Public ID to a meaningful terms. Change the time-slot as needed, in this case: 30 minutes time-slot, 8am to 3pm. Timetable information can be added. click on the first resource pencil icon to edit it. Change the resource name and add some information. Now send invitations to other users to share this timetable. 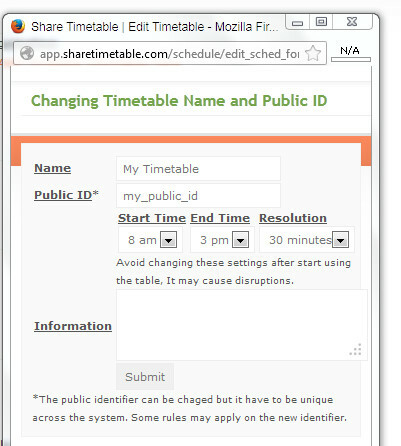 Invitation can be sent be informing others about this timetable and the timetable’s ‘Public ID’. 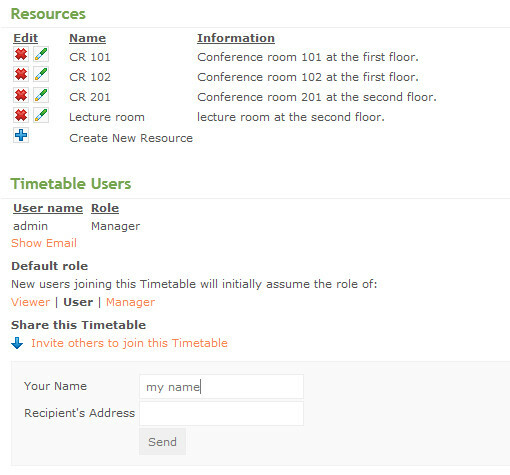 Invitations can be sent using the invite tool: Click on the ‘Invite others to join this Timetable’ and fill the details. the new timetable is ready and can be accessed in the ‘My Timetable’ PAge. Please leave a comment for additional information. Cool app. Is it possible to schedule a recurring booking for a resource? for example book a resource every tuesday till 15th of July from 9am – 2 pm etc.? Yes. Recurring booking is possible. In the booking edit pop-up there is a circular blue arrow, click it for recurrent options.